At the start of the 2-day event we will have a grid set up on a large board. There will be time slots and different rooms available. You are encouraged to think of a topic you’d like to discuss, or something that you’d like to share, and write down a title and your name on a post-it note. 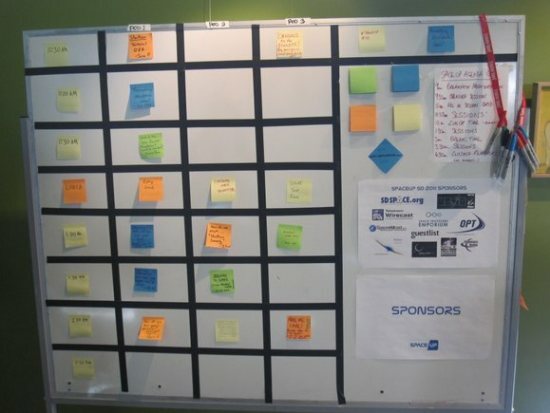 Pick an open slot on the board and as the grid starts to fill up, you’ll find yourself with plenty of choices of interesting sessions to attend. If there is a huge demand for a particular session we will ensure that it is held in the room with the largest capacity, but there will be space for smaller groups to have less formal conversations about a topic too. Sometimes a session will generate a lot of excitement and ideas – which is great! In that case you can schedule another slot to discuss how to make those ideas happen or take the discussion further. It’s up to the participants to choose what is most important or interesting to them, and we will help facilitate the discussions. Be sure to get your talk on the board as soon as the day begins so you don't miss out on your opportunity to participate. If you've never been to an "unconference" before, you might feel a bit hesitant about putting an idea on the board, or perhaps you just want to see how it all works first. That's understandable and we have some dedicated speakers to help infuse the audience with ideas for discussion, but we're a really friendly bunch and you'll get much more out of the event if you are an active participant. There will be people who've been to previous SpaceUP events to help you out, and plenty of others who are new to the concept. We'll be there to help connect you to interesting people and you'll soon get into the swing of it. Do I have to do a talk? Everyone is encouraged to think of something that they would like to see in a session, but that doesn't mean you have to do it on your own. Talk to other people and find out what their interests are, perhaps you can team up with them and create something together. Your organising team will be happy to connect you to people with similar interests so you can develop a session idea together. Got some specialist knowledge you think others would enjoy? Share it! Save the sales pitch for another day, SpaceUP is about discussing, learning, sharing, not the hard sell of a product! It'll be your call, but let's say between 5 minutes (what is known as T-5 talk or lightning talk) and 15 minutes. Our nominal slots are 15 minutes each. But there's no reason why you cannot chop and dice the slots! This is your option for a remote presentation! Space unites people all around the planet (and off it!) but we know that not everyone can make it to London for SpaceUP:UK. Don't despair! You can still be part of the UK's first SpaceUP event by submitting a "60 seconds to land" video that we can play out at the start of the event. You've got 60 seconds to tell us about your latest project, tell us what you think the big stories in space are that we should be discussing, or just wish us all well from wherever you are! Known as lightning talks elsewhere, these are the only option to pre-schedule your presentation! The joy of SpaceUP is the impromptu nature of the talks and discussions, but we understand that you might have something that you want to talk about, a project you want to introduce, or just have a rant about something in the space industry that makes you cross. T-5 talks are the answer. When you buy the tickets, you will be asked if you'd like to do a T-5 talk, just sign up there and then. We'd love to see exploratory and/or interactive formats. Discussion is a common one, but if you've got a new idea, bring it on!